Describing an industry as mature tends to connote visions of conservative businesses that follow established design formulas and serve equally established markets, with adequate but uninspired products. Though it would qualify as mature by virtually any sensible measure, the workstation market exhibits none of those traits that adjective might suggest. And no vendor in the industry has bucked the impression of a staid business any more than HP, both an industry pioneer with an impeccable pedigree, as well as a cutting-edge innovator in today’s market. Its latest workstation provides even more evidence of the latter. Last quarter, HP unveiled the Z2 Mini, a machine that takes the small form factor (SFF) trend to the extreme. Measuring just 2.3" x 8.5" x 8.5", the Z2 Mini is dramatically smaller (an HP-disclosed 90% smaller) than a traditional tower. It’s even a bit smaller than Boxx’s Apexx 1 workstation we reviewed last one year, though both deliver a drastic shrink on the already-quite-shrunk SFF class workstation. Both HP and Boxx faced major challenges cramming full-fledged workstation configurations into ridiculously small spaces. But while the Z2 Mini and Apexx 1 may share a comparable form factor, the similarities end there, as each vendor’s design approach yields a different take on the mini-workstation concept, with products specifically tailored for different market targets. With the Z2 Mini, HP took the miniaturization a solid step further than Boxx. The Z2 Mini is narrower than the Apexx 1 by a bit over 2" (while nearly identical in the other two dimensions). That’s not a significant amount if the machine is under the desk, but the difference makes the Z2 Mini amenable to behind-display mounting, increasing appeal in terms of both aesthetics and practicality. With that less-accessible mounting in mind, HP added the nice touch of providing a keyboard with a system power switch, making remote power-on simple, no matter where the box is located. We were impressed with what Boxx could fit in its Apexx 1, but even more so with HP, which had less space and fewer watts (200 W maximum) to work with. Our unit came outfitted with a 3.4 GHz Skylake class Intel Core i7-6700 CPU, an entry-class workstation-caliber Quadro M620 GPU, 32 GB of DDR4 memory, and 1.25 TB storage (including 256 GB SSD). Still, that doesn't mean the Z2 Mini doesn’t require a few compromises here and there. With the tight quarters and hard 200 W limit (of the power supply), they’re simply unavoidable. Like the Apexx 1, to hit such aggressive size targets, HP had to push the power supply outside the box. That means, like a notebook, you’ve got the power brick to position, not just the power cord. Fortunately, at around 7” x 3.75” x 1” the Z2 Mini’s brick is less than half the size of the Apexx 1’s bulky and heavy 8" x 4" x 2" supply, it’s still substantially larger than that of a mainstream 100 watt-ish notebook supply. Compromises, albeit not drastic ones, have to be made on components as well. The Intel Core i7-6700 is a premium SKU, but it’s not the highest frequency (and therefore watt-consuming) available. The machine can support a max of 32 GB, a reasonable number for most users but less than the typical 64 GB of a conventional entry deskside. Only one 2.5" drive bay exists (housing a 1 TB HDD), but fortunately HP designed in an M.2 PCIe interface on the motherboard to support up to a 512 GB PCIe/NVMe SSD (HP Z Drive Turbo branded). Above all, the main point of compromise would have to be graphics, where buyers can choose between either Intel's integrated Iris graphics or a Nvidia's now entry Quadro M620. A capable GPU that can serve mainstream demands, the M620 is still an entry class GPU, with more powerful midrange, high end and ultra-high end GPUs that the Z2 Mini’s size and power can’t accommodate. Designing to such a tiny footprint isn’t just about finding enough space in the chassis. More than just a function of fitting within the physical limits, the more difficult task is usually fitting within the thermal limits. For the Z2 Mini, keeping components cool was accomplished in three ways. 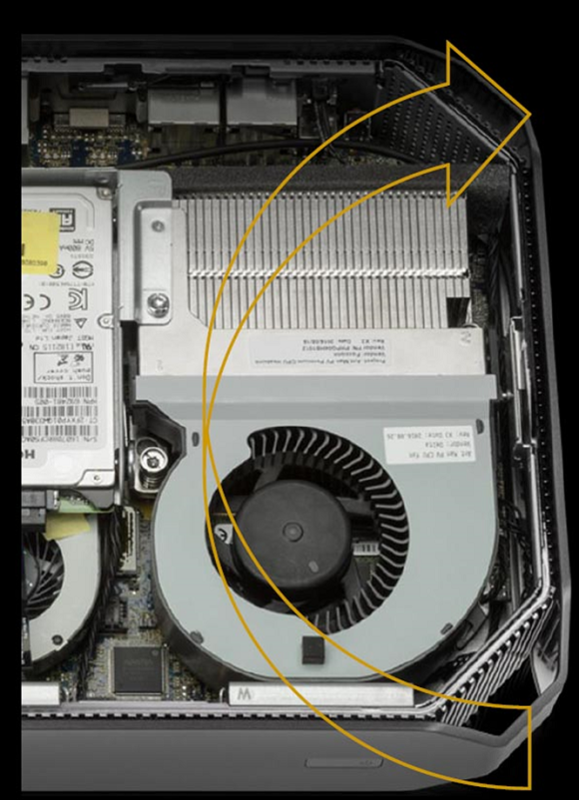 First off is that move of the PSU outside the box, not only freeing space but reducing the thermal footprint within the chassis. Second, HP chose a combination of components and frequencies to keep consumption safely within the 200 W limits of the PSU. Note the aforementioned 3.4 GHz (base frequency) CPU, a good distance from the cutting-edge of 4.0 GHz and beyond. Third, and as always, HP engineers paid careful attention to air flow within the chassis. That meant not only delivering enough cubic feet per minute, but delivering that CFM as efficiently as possible through the chassis, with the fewest airflow obstructions and no vulnerable hot spots. Optimizing air flow to dissipate the maximum heat at the slowest fan speed and lowest noise is the ultimate goal, one HP has proven itself quite adept, as evidenced by many Z-brand models over the past. Now, typical towers take air in the front grill and blow it out the back, but of course, the Z2 Mini is no tower. Instead, HP designed two angled vents on corners, one for sucking cool air in and the other for blowing hot air out. Still, despite such thoughtful engineering, there’s no escaping the fact that a fan and airflow will create some noise. No surprise, noise at idle was undetectable. But at heavy load (running portions of SPECwpc benchmark, noted ahead), the fans definitely cranked up to a very audible level. Our informal measurements didn’t show decibel levels beyond the norm (again, at load), but for operations running at heavy load often, the noise may become conspicuous to some users. The incredibly compact volume make expansion options obviously limited as compared to a full tower. But to service the machine and to provide clean access to storage and memory, HP made getting at the innards a very HP-like process. The company has always pushed the art of tool-less access to the max, most notably with its introduction of the Z line back in 2009. So not only is the Z2 Mini chassis accessible, in typical HP style, it requires no tools to do so. And while the compact design doesn’t leave as many upgrade options as a tower, HP made sure to make the two most likely upgradable components — drives and memory — most easily accessible. The 2.5” drive bay is right on top, and the system fan rotates to expose memory slots for upgrade. Some expansion is available outside the box, via the Z2 Mini’s copious I/O options. The backside contains different I/O ports, depending on whether the configuration is “Entry” or “Performance”. The discrete Quadro M620 of the Performance SKUs can support an additional DisplayPort for a total of four displays, and HP added two USB Type C ports to boot. To gauge performance levels of the Z2 Mini, we employed the latest version of SPEC's workstation-focused benchmark, SPECwpc 2.0. 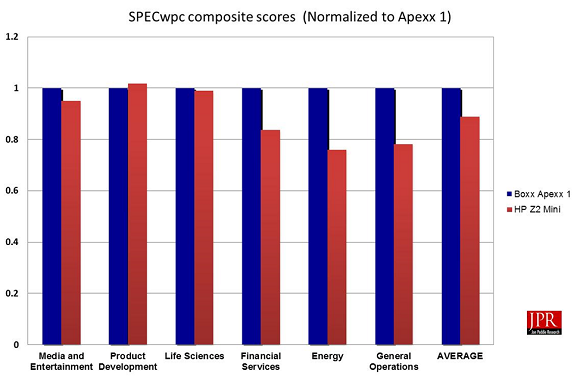 SPECwpc stresses all workstation components in a "whole system" environment that users experience. It even contains the same viewsets that its graphics-focused sister test, Viewperf, uses to measure rendering performance. 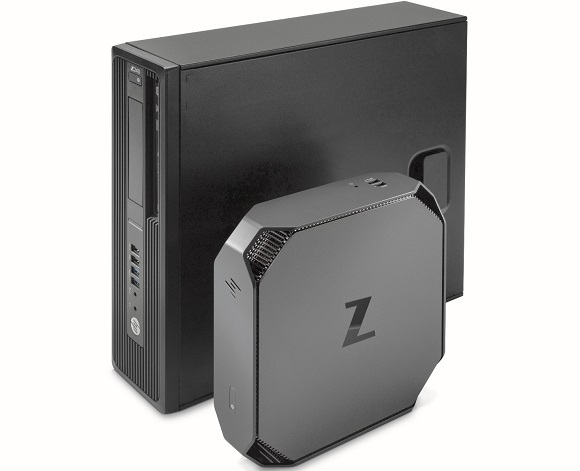 The Z2 Mini’s specs suggest performance worthy of a solidly equipped entry class workstation, be it housed in a tower or not. 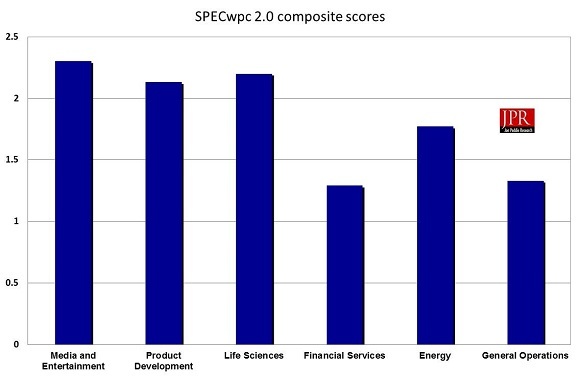 SPECwpc 2.0’s results echo that, and based on past experience, deliver performance on the upper end of what an entry-priced machine should. The Z2 Mini’s scores are particularly impressive given the $1,700 price tag, yielding noteworthy price-performance metrics we’ll dig into deeper just ahead. We compared the Z2 Mini, to the SPECwpc 2.0 results we ran on the Boxx Apexx 1. Now to compare Z2 Mini performance with that of the Apexx 1 doesn’t mean we are placing the two are on equal footing … we’re not. Though the two machines do fit a similar footprint and target similar applications (most notably Media and Entertainment), the Apexx 1 is considerably more expensive. Where the Z2 Mini’s $1,700 price tag puts it squarely in JPR’s Entry class (<$2,500) — and runs even a tad below the workstation market’s overall $1,900-ish ASP — the Apexx 1’s price of $3,711 puts it up in the midrange and at nearly a 125% premium. So no, the Apexx 1 and Z2 Mini won’t appeal to the same set of buyers, as those looking to spend $1,700 aren’t going to typically consider a $3,700 machine, and vice versa. But a comparison of the two machines is valuable nonetheless and can provide some insight into the impact of the vendors’ very different design tradeoffs. Furthermore, it provides buyers some insight into what additional dollars can buy — or maybe can’t — in a similarly-sized workstation. Though they bear subtly different SKUs, the two machine’s CPUs are derived from the same chip. The one significant difference between HP’s Core i7-6700 and Boxx’s Core i7-6700K is (no surprise) in the “K”, which indicates the CPU clock multiplier is unlocked. That is, it can be overclocked, which is precisely what Boxx did, pushing up the base frequency to 4.4 Ghz. The Z2 Mini’s CPU clock is set to its nominal and far more mainstream 3.4 GHz (with transient Turbo to 4.0 GHz). Where the year older Apexx 1 was outfitted with 16 GB of DDR4 memory (at 2133 MHz), the Z2 Mini gets twice as much capacity and modestly higher frequency (2400 MHz, for higher commensurate bandwidth). The size of the PCIe SSDs are different, 256 GB versus 512 GB, and the Apexx 1's solution did not support NVMe technology at the time of review (though presumably, a year later, it would now). The GPUs are not far off from one another, though the Apexx 1’s Quadro K1200 holds an edge in computational power (TFLOPS) over the Z2 Mini’s Quadro M620, as well as populating twice the graphics memory, 4 GB to 2 GB. Normalizing the Z2 Mini’s scores to those of the Apexx 1, as expected we see the more expensive Apexx 1 gain an edge, albeit not a dramatic one. But again, this is not at all an apples to apples comparison, and when considering the 125% price premium of the Apexx 1, the Z2 Mini looks much more compelling for the majority of buyers with more typical, mainstream budgets. If we look at normalized scores per dollar, we see the Z2 Mini delivers nearly twice the price-performance of the Apexx 1. With this review and comparison, we also get a chance to get an idea of how much the NVMe protocol for PCIe SSDs is buying. Both machines integrate PCIe SSDs, but the new Z2 Mini’s SSD runs on the NVMe interfaces, while the Apexx 1’s did not. Migrating into SSDs and systems in 2015 and 2016, NVMe is the new standard for controlling data transfer between memory and PCIe SSDs, displacing the legacy Advanced Host Controller Interface (AHCI) from Intel. AHCI was originally developed in the context of HDDs, and there was little need to make the protocol fast when the HDDs were so slow to respond. But SSDs are fast, particularly on PCIe, fast enough that AHCI was becoming the bottleneck. NVMe now alleviates that bottleneck allowing throughput to more closely approach the physical limits imposed by PCIe and the devices themselves, particularly when it comes to returning read data from addresses that are more random than sequential. As the chart below illustrates, aggregating the four IOMeter components of SPECwpc, the Z2 Mini’s SSD NVMe subsystem does indeed provide a meaningful boost in storage performance, approaching 50% faster on average. Contrasting the engineering and design approach Boxx took with the Apexx 1 and the approach HP took with the Z2 Mini is revealing. It shows two vendors taking a similar starting point (in base form factor) and creating differently shaped products that appeal to different segments of the market. 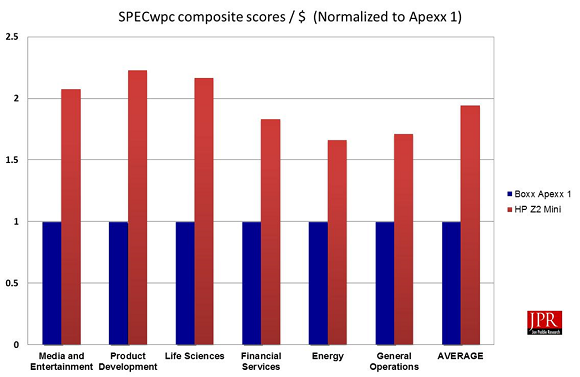 The Apexx 1 can deliver measurable, but not dramatically higher performance, in a modestly bigger package and a 125% or so premium in price. That exactly fits Boxx’s policy, to offer maximum performance and damn the price, enticing existing users of midrange or high-end workstations to possibly consider the appeal of a mini form factor for their next machine. HP crafted the Z2 Mini for a very different purpose, and it shows. It’s not about lunatic-fringe performance, but capable, workstation-legit performance in the smallest package anyone’s yet seen. Not surprisingly, the far more cost-effective Z2 Mini blows away a machine like the Apexx 1 in price-performance, by nearly a factor of 2. And today, that leaves the Z2 Mini standing alone in delivering mainstream workstation performance at a mainstream price … and in a ridiculously small package. In summary, we see two vendors start with basically the same mini-workstation concept and create very different products, yet each consistent to the vendors’ respective business models. 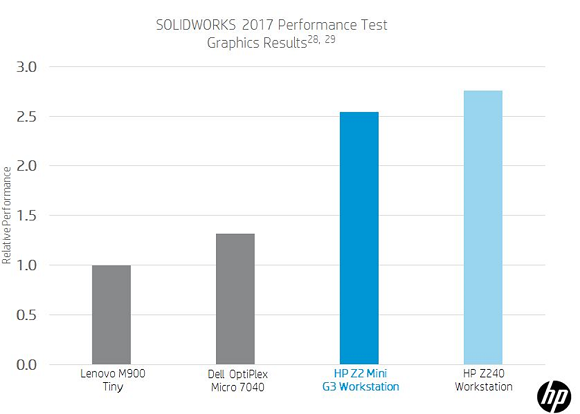 But honestly, not only does HP not care about having the Z2 Mini compete with a workstation like the Apexx 1 — that’s obvious — but we don’t think it’s particularly interested in having it compete with workstations at all. 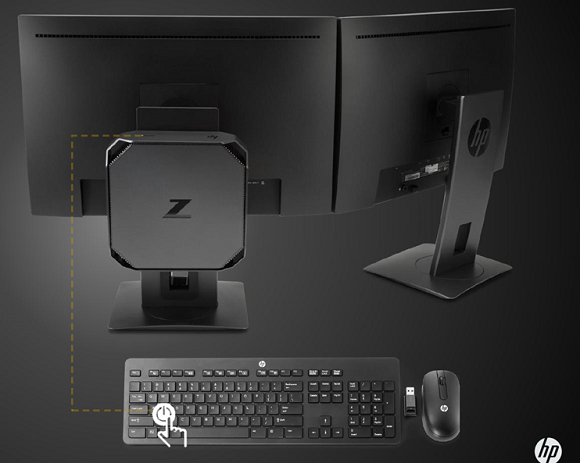 No, HP didn’t build the Z2 Mini to cannibalize existing workstation users, though that may happen to some degree. Rather, with the HP Z2 Mini, the company is making a concerted effort to tap into a much bigger pond, with a whole lot of new fish to fry. As we’ve preached for years, the workstation market should remain healthy and grow, at the very least on the back of a growing number of professional users. The more architects, designers and content creators putting up a shingle, the more workstations will get sold. But while that reliable growth is welcome, it’s not all that exciting a magnitude, roughly on the order of GDP. But if a vendor could find a way to double or triple that growth — well that would be the big prize. Doing so, however, would mean tapping a much larger served market than the industry currently does. Now there are two served markets out there that have long represented a possible boon for workstation vendors: visual computing professionals who currently use PCs, and visual computing professionals who currently use Macs. And those are the real targets for the Z2 Mini, a workstation in a svelte package far more likely to attract those users than the typical tower. HP estimates the size of the former group at around 5 million (think AutoCAD users, as a start). Our estimates put it somewhere in the single digit millions as well, and either way it’s a number that could have a dramatic impact on workstation market, should we see significant emigration of those users from PCs. On top of that, toss in about 100K or so Mac Pro desktops that ship a year (JPR estimate), and it wouldn’t be unreasonable for the workstation industry to shoot for at least 100-200K or so new adopters a year from both pools of users. If that were the case, you’re talking an additional growth of 3 to 6% growth on top of the organic GDP’ish baseline. Credit HP for not sitting back an accepting the status quo, but instead realizing that there are a whole lot of users that would benefit from workstations but don’t. Luring them over will mean a whole lot of evangelism and education, as well as the right vehicle to entice the migration. The former remains a big challenge, but as far as a vehicle, the Z2 Mini is as good enticement as any we could imagine.